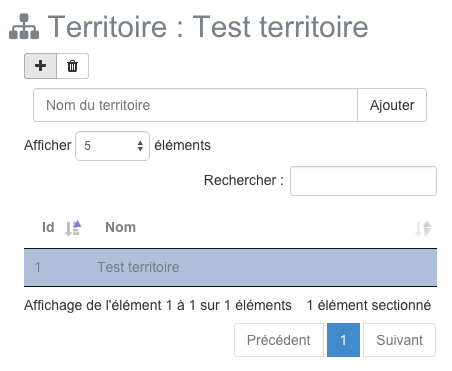 A territory consists of a name and a source of geographical data present in the PostGIS database of your instance MapMint. The territories are used as input parameters of the Module creation indicators. To add a new area, click on the corresponding icon in the toolbar on the left panel. This shows the addition of territory form as shown below. Please specify a name in the text box provided at this end and click on the “Add” button. This causes the form are gone, adding land to tree and reloading of the panel of Information panel, to the right of the screen. 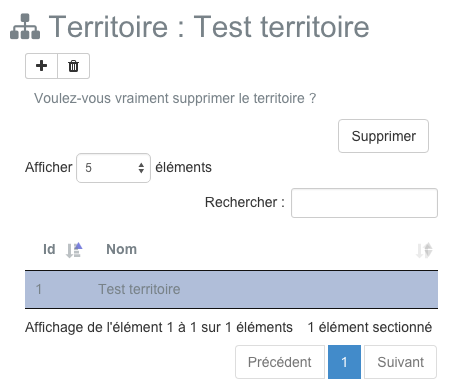 To remove an existing territory, please click on the name of the territory in the table, then on the icon to delete in the toolbar on the left panel. This displays the form of suppression of territory as shown below. Click the “Delete” button. This causes the form are gone and the removal of the tree area.